The great outdoors. A place to learn, discover and play when you're a child, with so much to see and do. As a family we love nothing more than exploring the outdoors together, whether that be a beautiful walled garden attached to a big old house, a park or simply in our garden. The combination of fresh air and lots of space makes being outside the perfect place for toddlers and children alike, as they can burn off their seemingly endless energy and learn through play. Plum Play create a wide range of garden play equipment to enable children to do just that, with something for all ages and garden sizes. Since having children I have always loved the play equipment Plum Play have to offer because there really is something for all ages of children, types of play and they all support the development of our children. Isabella has always been a child who loves to explore outdoors, so creating a garden that enables her to do that was really important. Now that Poppy is sitting up and attempting to crawl around, it won't be long before she joins Isabella in all of the outdoor adventures. 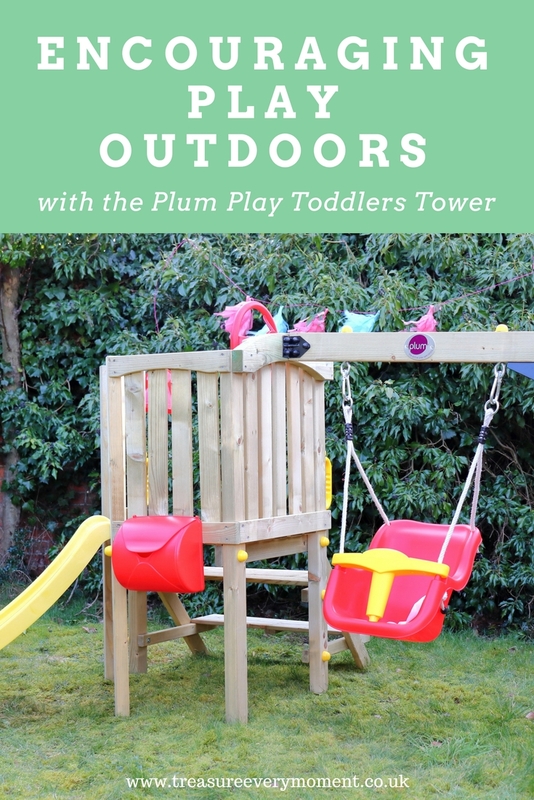 Plum Play have created the Toddlers Tower (£274.99) for 12 months+, which is the perfect introduction to having fun, learning and exploring outdoors. The cleverly and carefully designed wooden tower includes a slide, bell, steering wheel, steps, swing and post box, so there is plenty for toddlers to discover. The swing has a higher back and seat belt, so that your child is completely supported when swinging. The addition of the bell, letter box and steering wheel all support Plum Play's mission to create garden equipment that will grow with your child, which is something I really love about the brand. They consider how children's play changes as they get older and clearly take this into account when coming up with their products. On the packaging it advises that to build the Toddlers Tower it will take two people five hours, which can be a challenge when you have children. However, my husband made most of this by himself (while the girls and I played in the garden, I made cups of tea and guided from a distance!) and it took him around five hours. It was only at the final part of putting the structure together was when it helped to have two people to hold everything in place. The tower is so considerate to the little people it is designed for, with curved edges, caps to cover bolts and soft feel ropes from the swing. The moment it was finished Isabella couldn't climb up and go down the slide quick enough. The steps are two planks of wood wide, so perfect for toddlers who aren't completely confident on climbing ladder type steps and there are handles around the tower to help support too. The tower also isn't very tall (123cm) for a climbing frame type structure, which makes it seem a lot less imposing in the garden and reassuring when your little one is climbing around on it. It is also the perfect height for throwing a large sheet over and creating the quickest outdoor den you'll every make. It would be such a special gift to give for your baby's first birthday because as they grow older they will be able to access it is different ways. Isabella is almost three years old and although she is now too big for the swing she has loved putting her dolls in to swing them, as well as climbing up the tower, 'steering' her way around the garden, ringing the bell and of course coming down the 4ft slide! One of her favourite games has been to set up a little shop (normally based around ice-creams) at the top of the tower and insist that we come and buy from her. She'll ring the bell when the shop opens and closes, we post money into the box and she'll slide down to deliver our order. It always fascinates me the imagination of toddlers and children; they will make the Toddlers Tower into anything they want it to be. Excitingly Plum Play are giving you the opportunity to not only win your own Toddlers Tower, but also a freezer full of Claudi & Fin Greek Style Frozen Yogurt Lollies!! When they say freezer full, they really do mean a freezer full....look at all of those lollies! Isabella has quickly become a massive Claudi & Fin fan and requests one most meal times. The lollies are made from Greek style yogurt, packed with three times the amount of real fruit purees and available in Strawberry, Mango or Peach & Apricot. The fact they're shaped like a rocket is also of great appeal to Isabella and it's reassuring to know that she's getting some goodness too. All you have to do is to enter via this Instagram post for your chance to win. To celebrate 30 years of play Plum Play are also running a competition on their website for a chance to win their new 12ft Create Your Own Springsafe® Trampoline, suitable for 6 years+, and 2 Fitbit Zips for your family. To enter this competition simply head over to their website. Good Luck if you enter either or both of the competitions Plum Play are currently running and make sure you like their Facebook page for more giveaways in the future. What's your child's favourite activity outdoors? *The post contains PR samples, as always all opinions are my own and 100% honest. This looks like an amazing piece of gear I wish our garden was bigger so we could have something like this in it! Lucky Isabella having this in her garden! How fantastic! Thanks for the info on the competition. This looks really lovely. I have got a whole series coming out in a few weeks about outdoor play for different age groups so I love to read about things like this! My 3 year old would love this! He loves spending time outdoors, its a shame we don't have a garden otherwise I'd so get this for him! That is an amazing looking outdoor play set. My son would love something like this so I'm off to enter! I need to get some outdoor toys for the kids this summer. These look brilliant. This looks fab. We've been keeping an eye out for something similar, but our kids are a bit older so would need something a bit bigger. We have the Plum Play Toddler Tower and it is absolutely amazing for little ones. It is always being played with and is always a hit at birthday parties or playdates! Mine are growing out of it now, but we would definitely buy another Plum Play product, they are great and built to last! This is so cool! Any kid would love to play with this. I mean, who woudn't? What a great piece of kit! Would love something like this for my boys in the garden. What an amazing piece of garden play! This looks fantastic and definitely perfect for getting the little ones out and playing in the garden. I've been looking for something like this so going to look into This one. My nephew has always loved playing outdoors and would rather be out there than indoors, what a lovely competition.